On Friday April 7, 1972, a contingent from George Mason College, led by Chancellor Lorin A. Thompson, met with Virginia Governor A. Linwood Holton at Richmond. They were there to participate in the Governor’s signing into law Virginia General Assembly Bill H 210 separating George Mason College from the University of Virginia at Charlottesville and renaming it George Mason University. During the brief afternoon ceremony Thompson, George Mason College Dean Robert Krug, Virginia Delegate James Thomson, and members of George Mason’s Advisory Board and Student Government proudly looked on as Holton signed one of the most critical documents in the history of the very young institution. For its first twenty-three years George Mason University and its “ancestors” were part of the University of Virginia at Charlottesville, initially as extension center and later as a branch college. Mason began down the road to independence in the mid-1960s. In 1965 Northern Virginia’s unprecedented growth, highlighted by a dramatic increase in the population of college-aged men and women, pointed out the need for a four-year institution of higher learning in the area. Both the University of Virginia and the Commonwealth became acutely aware of this need. In a December 1965 report to the Governor and General Assembly, Virginia’s Higher Education Study Commission recommended that new four-year institutions of higher learning be introduced in the Northern Virginia and Tidewater areas of the state. The report also suggested that the Northern Virginia institution be independent of the University of Virginia and have a more inclusive admissions policy. In 1966, Alexandria Delegate James Thomson, with the backing of the University of Virginia, introduced a bill in the General Assembly to make George Mason College a four-year institution under the University’s direction. The measure passed the Assembly and was approved on March 1, 1966. Although not independent, George Mason College was now a degree-granting institution and managed some of its own administrative functions at the Fairfax campus. By September 1966, George Mason’s new Chancellor, Lorin A. Thompson, was reporting directly to University of Virginia’s president, Edgar F. Shannon. Although the University’s Board of Visitors and president at Charlottesville still made major decisions regarding George Mason’s overall operation and future, two groups made up of northern Virginians, helped to advise the University on issues pertinent to George Mason College. The Board of Control was made up of eight prominent northern Virginians appointed by local jurisdictions. The Advisory Board was made up of local citizens appointed by the University’s president, Edgar F. Shannon. Beginning in 1967, under the guidance of Chancellor Thompson, George Mason College took several initial steps toward becoming a viable independent institution. A number of key studies were done by and on behalf of George Mason. Each of them recommended the expansion and eventual independence of the college. In a document entitled A Regional University for Northern Virginia (November 1967), Chancellor Thompson foresaw the development of George Mason into a major university and outlined what was needed in terms of budget, land, buildings, and personnel. The Educational Plan for George Mason College of the University of Virginia (January 1968) detailed academic program proposals for an institution expected to grow six-fold within ten years. Finally, the George Mason College of the University of Virginia Master Plan (August 1968) detailed the infrastructure needed to accommodate a major university. These studies each anticipated a student body of 10,000 to 15,000 from 1975 to 1985. In 1970 George Mason prepared for accreditation by the Southern Association of Colleges and Schools. In its June 1970 Self Appraisal, it listed among its priorities the need to be a service university for the growing Northern Virginia area and to fill in gaps where the University of Virginia could not as was recommended by the 1965 Commission on Higher Education report. The Self Appraisal noted that the Northern Virginia area was unlike other areas in the state with its high population density and high degree of economic and intellectual resources. During the 1970 fall semester, George Mason introduced graduate degree programs in biology, mathematics, and education. Enrollment had grown to 2,390. Between 1971 and early 1972, a series of decisions and subsequent events involving the University at Charlottesville and its other branch colleges, the State Council of Higher Education for Virginia, and the Virginia General Assembly advanced George Mason’s status towards independence. Firstly, President Shannon and Dr. Roy E. McTarnaghan, Director of the State Council of Higher Education, continued their long running dialogue about whether the University should grant independence to George Mason College or retain it in the University system. They corresponded several times to discuss the merits and drawbacks to both positions. It was by then no secret that McTarnaghan supported independence for George Mason College. Secondly, the University had begun to divest itself of its remaining branch colleges. Patrick Henry College at Virginia Beach was transferred to the state system of community colleges on July 1, 1971. In December 1971 the University’s Board of Visitors voted to recommend to the State Council of Higher Education that Mary Washington College at Fredericksburg become an independent institution. At the same time, Delegate Thomson, who figured prominently in the legislation making George Mason a four-year degree-granting institution in 1966, was drafting legislation to make George Mason an independent institution. The bill, H-210, was introduced into the General Assembly on January 24, 1972. At their February 3, 1972 meeting at Charlottesville, the University’s Board of Visitors adopted a resolution to recommend to Virginia Governor Holton and the legislature that George Mason become independent of the University of Virginia. In effect, they endorsed the legislation already introduced by Thomson. In the resolution the Board cited George Mason’s accomplishments, accreditation status, current and expected growth, financial support, and the backing of the State Council. On February 11 the House of Delegates, and on February 23, the Senate unanimously approved the bill making George Mason College independent effective July 1, 1972. The legislation also made provisions for the creation of George Mason University’s first Board of Visitors, which was appointed by Governor Holton later in May. 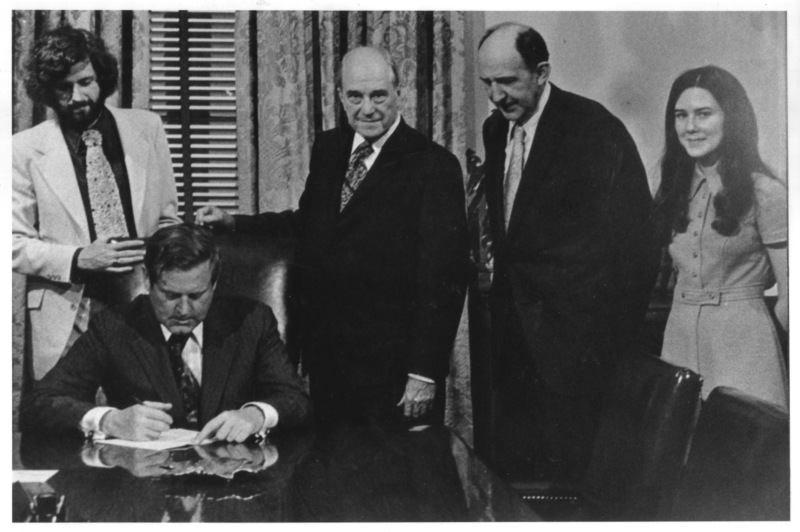 Governor Holton made George Mason’s separation official in Richmond on April 7, 1972 when he signed the bill creating George Mason University in the company of George Mason administrators, faculty, students and Northern Virginia community leaders. Browse items pertaining to Mason's independence from the University of Virginia.